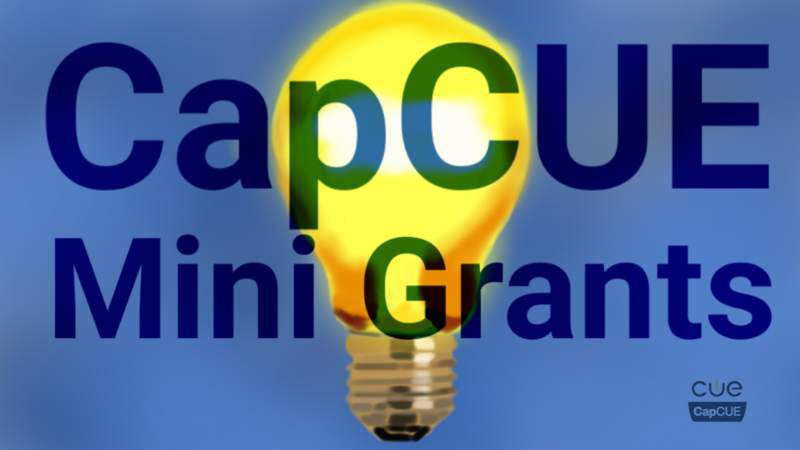 Through the Mini Grant Program, CapCUE supports educators in their development of innovative instructional technology practices. WE SUPPORT THE TECHNOLOGY PROJECTS THAT WILL HELP YOUR CLASSROOM OR SCHOOL WITH THE EASIEST WAY TO GET FUNDING FOR YOUR CLASSROOM. How easy is it? Check out the video below from mini grant winner and CapCUE Board member Corey Coble. When is this going to happen. ​And back to your students !!! $390 "3D Printing for Science"
$500 "Get Physical with Raspberry Pi"
$500 "CUE Up the Code"
$500 "Mini Mobile Recording Studio"
$500 "Recording Kits for PE"
​﻿Please read the information below and consider applying. CapCUE supports the Northern California region by providing collegial conversations and professional learning opportunities for educators regarding the use of technology in the classroom. Through the Mini Grant Program, CapCUE supports educators in their development of innovative instructional technology practices. Grants will be awarded to teachers in the amount of $500.00. All certificated personnel in the CapCUE region are eligible to apply. Grants may be used to purchase hardware and/or software to meet the specific instructional goal(s) of the grant proposal. Awardees will share the results of their project with the CapCUE community at a future event.